A "polynomial" may contain one term (monomial), two terms (binomial), three terms (trinomial), or more terms. We have seen monomials multiplied by other polynomials, and binomials multiplied by binomials. Now, let's see what happens when other combinations of polynomials are multiplied. There are various set-up methods possible when multiplying polynomials. As the number of terms in the polynomials increases, the vertical multiplication set-up is much more likely to yield a correct result. It neatly organizes your work which helps eliminate careless errors. The following examples will show various set-up methods for the multiplications. Notice that FOIL will not work to solve any of these problems. 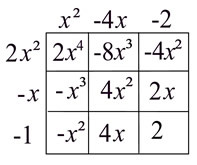 Vertical Set-Up: Line up the polynomials as you would for numerical multiplication. Be careful of your signs. Horizontal Set-Up: Multiply each term of the binomial times each term of the trinomial. There will be 6 multiplications. Combine the like terms. • Place one of the polynomials along the top and the other down the left side. • Position the terms so that each term (and its sign) lines up with a row or column of the grid. • Multiply each intersecting row and column to fill the interior of the grid. • Copy and add all of the terms in the interior of the grid. Horizontal Set-Up: Multiply each term of the binomial times each term of the cubic polynomial. There will be 8 multiplications. Combine the like terms. Grid Set-Up: Set up the grid and multiply. Vertical Set-Up: Line up the polynomials as you would for numerical multiplication. Be careful of your signs. If a term is missing, replacing it with 0 (such as 0x in this example) may help you to line up the terms correctly. Including the missing term will keep the diagonals working properly in the grid for adding purposes. Horizontal Set-Up: Multiply each term of the first trinomial times each term of the second trinomial. There will be 9 multiplications. Combine the like terms.